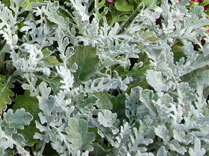 Dusty miller is grown for its silvery-white delicately divided leaves that are covered with a very soft, dense fuzz. It provides a great contrast color as a filler in hanging baskets and pots of mixed flowers, and it makes a nice border for flower beds. To encourage leaf growth, pinch off the pretty yellow flowers as they appear. 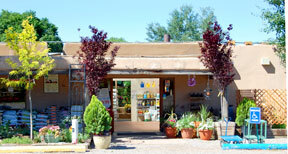 It is drought tolerant once established, easy care and deer resistant. It can tolerate a light frost.